Why every business just keeps talking about customers at every step? The deals which entice customer brings a business at the top, whereas, the customer retention wants further push along the line. What is it actually, which attracts the customer? What are the factors, which make trends? Whether it is a website or an app, user engagement is the core task of all cost invested. The customer visiting the website or app gets an impression over the mind for the ecommerce development company. This impression is the key factor, which becomes the mouth publicity, and builds the reputation for no cost. There is all sort of insights and metrics available to analyze and count the customer engagement, but once taking all the fuss out of it, let's get down to what is customer engagement and why does it matter so much? Customer engagement is nothing more than the physical store crowded with customers. Some are just the pass by, while a few give the real sale. This is the called the customer engagement where the customer keeps on coming for the service repetitively. For a custom software development company, page views, onsite time and email open rates, make the calculation of customer engagement. Companies keep on investing in customer engagement but the easiest method is to keep the e-commerce app development customer-oriented or paying the attention to a few tips while developing the app. Low: User buys your product once but does not come back again. Mediocre: User likes your brand and buys back again. High: User loves your product and definitely picks you over the competitors. Highest: User does not get enough of your brand and not only buys back but also keep encouraging your product over others. In this article, we will focus on some effective strategies to increase customer engagement. Omni-channel marketing: In place of focusing on customer engagement through the single channel, the Omni-channel proves out to be beneficial. Looking at the current scenario, it is always a prudent option to devise the acute and multidirectional marketing strategy. An e-commerce app must be designed in a manner to provide customers with a great shopping experience. The customer feels inclined to the businesses, which offer them a great level of personalization. The business wants to retain the customers, so they are choosing a powerful framework with immense capabilities. People relying on the powerful Magento are looking to Hire Magento developer for retaining the customers. When a customer leaves the app at mid, his preferences must be saved. So that the customer can start his session from where he had left. The elegant design and intuitive UI eases the task of marketing persons. It must be easy for the user to reach the desired section without tangling into multiple links. To render the best to a user, companies are hiring the experienced JS developer, who is equally competent in delivering a powerful mobile application. Alongside, there are few powerful e-commerce platforms available, which reduce the stress of developers from falling into intricacies and deliver the uncluttered content. Magento is one of the most famous platforms, Hiring Magento developer for your e-commerce application development, the customer can be saved from distress. Reviews and Feedback keep the customer engaged and your product growing with positive user sentiments. The question forum invites the customer who is already loyal to your competitor's brand. If your product really contains the value, the positive user sentiment always increases the customer loyalty and affects reputation, decreasing the overload for website Development Company. However, it is an attempt of personalization, but still a robust technique to engage customers. The old school techniques lagged the e-commerce stores behind the brick and mortar stores. The custom software development company takes an innovative approach to live chat solutions. The live chat solutions help customers in solving their query easily through the automated chat bot reducing the dissatisfaction. This mitigates the need to talk with a sales representative and ultimately led to increased sales. Push notifications are a great way to keep customers aware of the deals and trending discounts at the store. 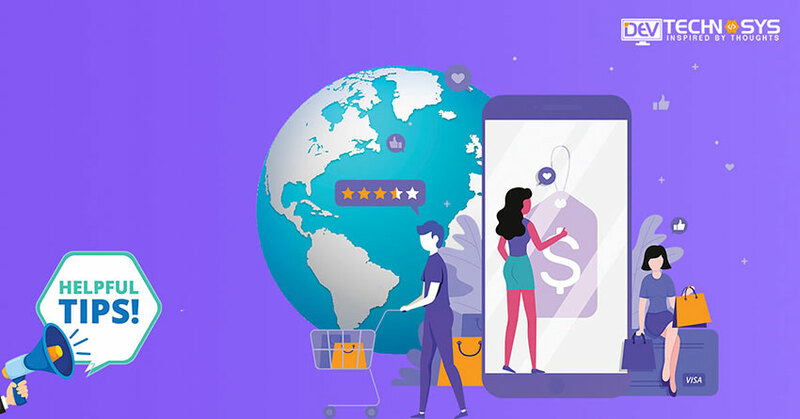 The e-commerce development companies make the e-stores capable of reading customer behavior and shoot the targeted notifications as per the preferences. Timely push notifications motivate the customer to visit the store but sometimes it becomes annoying for the user. There must be very limited steps for signing up and ordering the product. There must be enough options for payment. Confusing components must be avoided. For ensuring your user to not leave the app, it is recommended to keep it as simple as you can. The easy to decipher design and optimum information over a single page increases the life span of the e-commerce app. The customer never compromises with the quality, after all, he is the payer of the services. Our business is because of the customer. The web site development companies are suggested to make the apps with robust backend and database support in order to increase the performance and give customers swifter navigation to the desired section. Finding the expert developer or the experienced team of developers can easily render a capable app to handle the multiple requests at a time. If you are not sure which technology to choose for e-commerce app, I will personally recommend you to hire Magento developer. E-Commerce development is an essential part of every brick and mortar store if it wants the expansion of a business. The custom software development companies keep incorporating the innovative solutions for innating the best they can provide to customers. The perfect business model is one, which treads along the market. Though above-given steps are not all enough still, they are essential for an app to retain customers and achieve long-term success.